Researchers from City University London have brought Iranian music to the British public helping to forge a new appreciation of the country's rich culture. Senior Lecturer Dr Laudan Nooshin's research has involved several periods of fieldwork in Iran, extensive work with Iranian communities in the UK and analysis of Iranian music, generating insights into both contemporary and historic forms of Iranian music cultures in Iran and around the world. She has collaborated with British schools, organised festivals and worked with the media to generate public discussion and promote greater understanding and cultural tolerance at a time when there has been a negative representation of Iranian culture in the British media. 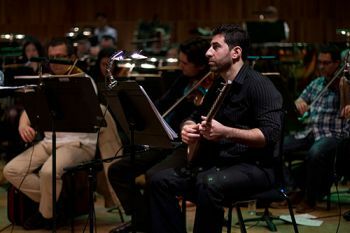 One way Dr Nooshin achieved this was through The Shahnameh Project - a collaborative outreach project with the London Philharmonic Orchestra (LPO), which she initiated and led. The project also involved one of the LPO's partner organisations, the Bridge Project (an organisation providing free music tuition to children who might not otherwise have the opportunity to learn an instrument). The Project introduced key stage 2 children (ages 7 to 11) to Iranian music and culture through several workshops and teacher-led activities. The children were introduced to Iranian instruments such as the Tanbour - a long-necked lute with three strings which are plucked and strummed by the performer; the Tombak - a wooden drum with a skin head, shaped like a goblet and which is held over the player's knees; and the Daff - a large, round frame drum with a skin (or nowadays more usually synthetic) head and lots of metal rings on the inside of the instrument so that it makes a loud sound when you shake it. 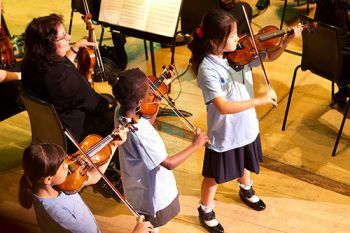 Composer David Bruce devised a specially-commissioned piece for the orchestra called Prince Zal and the Simorgh which was premiered at two LPO BrightSparks schools' concerts at the Royal Festival Hall in May 2012. Around 5,000 children and their teachers attended these concerts. The majority of children attending the workshops had not seen or heard the Iranian instruments before. Many had not previously attended an orchestral concert. Dr Nooshin wrote a Teachers' Guide, introducing Iranian rhythms and instruments as well as addressing broader cultural issues and including practical classroom activities. The Guide was available through the LPO website, together with relevant sound examples. Additionally, two training sessions, led by Dr Nooshin and Patrick Bailey (LPO Education and Community Department) were attended by 35 teachers, to assist them in preparing pupils for the concerts. Dr Nooshin's outreach activities have also included convening a festival of Music in Middle Eastern Cinema, including screenings at the Tricycle Theatre, Kilburn, London, funded by TCCE (previously LCACE) and Iran Heritage Foundation (IHF); advising the IHF on music for a promotional film by Sogand Bahram; and speaking at and chairing sessions for the London Borough of Kensington and Chelsea's Nour Festival of contemporary Middle Eastern and North African arts. Dr Nooshin has contributed to several high-profile publications aimed at the general public, including The Rough Guide to World Music: Africa & Middle East; Songlines: The World Music Magazine which has an average international circulation of 20,000 per issue; and The Middle East in London magazine. Dr Nooshin has also written CD liner notes for prominent Iranian vocalists including Mohammad Reza Shajarian and appeared on the BBC Radio 3 programme World Routes reviewing current Iranian music CDs. Dr Nooshin's work has influenced attitudes and perceptions of musicians, scholars, readers and listeners; enriched the cultural lives and aesthetic experiences of children and adults in a range of performance and multimedia contexts; enhanced knowledge and understanding in different educational environments; and contributed significantly to the preservation, renewal and interpretation of Iranian musical heritage. A documentary about the Bright Sparks project.